Clearly I am on a sticky note kick now (see yesterday’s post)! 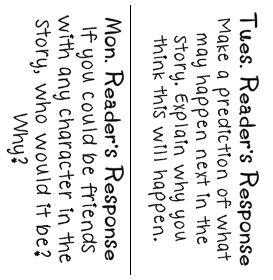 But I’m thinking I may have found a way to differentiate and manage my Reader’s Response questions much more effectively! To backtrack a bit, I had been writing the Reader’s Response question on the board each day at the start of Reader’s Workshop. But this hasn’t worked so well. For one thing, it was hard for everyone to see from their writing spot…and I like my students to sit where they are comfortable during Reader’s Workshop. Another problem was the need for differentiated questions. Since I teach ELL newcomer students, the range of language and reading levels is great. As the year progressed, I found myself writing more and more response questions on the board, for individualized students. I thought about typing them out on paper, but that seemed wasteful since we use composition books for our responses anyways. So…thanks to my newfound love of printing on sticky notes, I think I may have found something that will work–printing two response questions on one Post-It!! This may sound strange, but I think it will work for many reasons. First of all, it will save paper. Plus, a half Post-It is the perfect size for a question! It will also allow me to plan out my response questions for the week and completely differentiate them for all of my students. 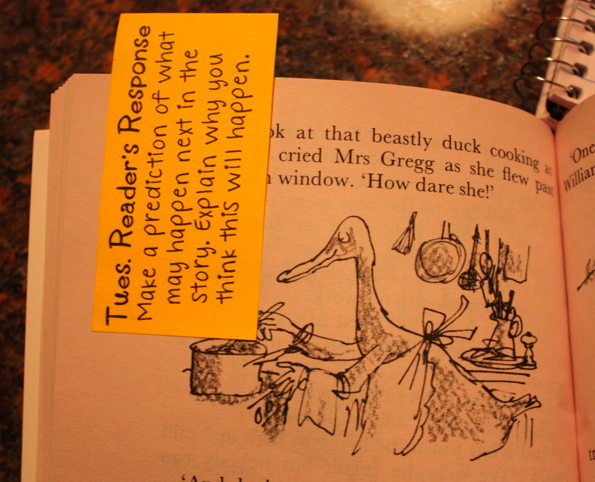 I know I could totally do this on slips of paper, but the Post-It will come in handy other ways too. 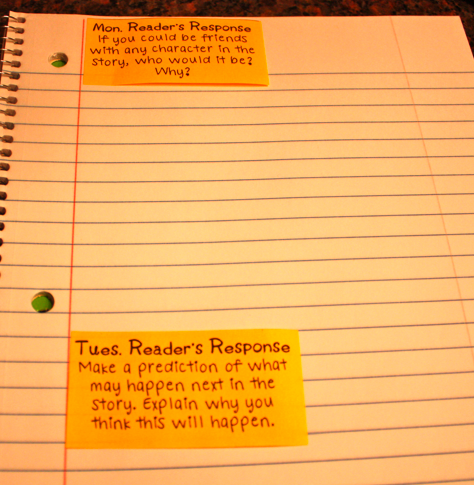 For instance, I will hand out the sticky notes at the beginning of Reader’s Workshop, so the students can keep them in their books as a bookmark while they read and a reminder of the question they will be accountable for in their response journals. On a side note…from my scientific observations of sticky note-usage, I figure they have about a five-time stickiness factor. So they could transition from my pre-made set of response questions, to the student’s reading book, to the response journal and still maintain enough stickiness. Right?? It’s in the testing stages right now as I post! Anyhow, the plan would then be to put the sticky in the journal and write the response. I like the flexibility of space this allows for (since I have very limited writers and those who can write up to two pages for a response). …I made it so the sticky part is on the left side of the paper). Is this something you might try out too? Should I share response questions as I make them? It will be quite the range (from basic prompts to more open-ended questions). The file below is in a Word Doc format so you can type in your own response question. It looks weird in GoogleDocs but I think it should download in the right format (though, lately, I am unsure of many things regarding GoogleDocs!). 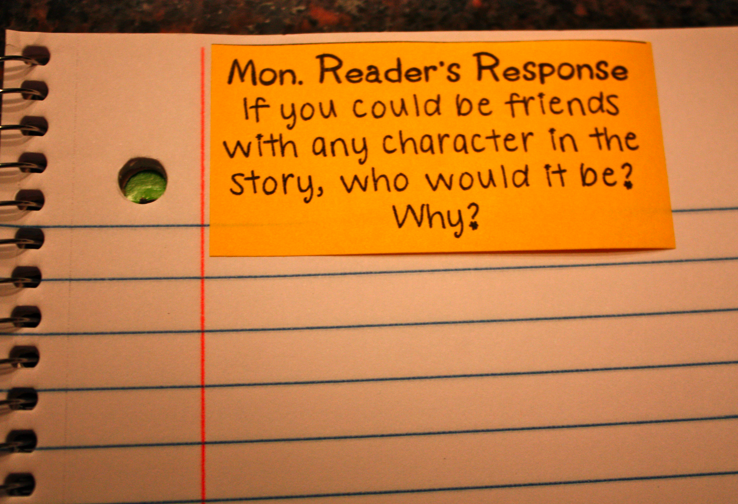 I love your sticky note response ideas and would be very interested to read the response questions you make. Thank you so much for sharing! Kristen, I am pretty much obsessed with this!!!! Thanks sooo much for sharing!I will definetly be doing this next year!!! What a GRAND idea! I love post-its and my kiddos do too! I can't wait to try this out. Thanks so much for sharing! You are a genius! PostIt would love to see their products in action. Now, all I have to do is think how I can use them with early emergent readers and writers. I'm thinking sight words! I am interested in any response questions you make. Also thank you for the template, that way I can mess around with different ideas. Love, love, love it!!! When I downloaded the reader's response template, the template made the columns long and narrow- don't think this would print correctly. Maybe it's the font- what font did you use? I may be able to download it, if you remember where you got it. Thanks again for sharing such a fabulous idea. Love the photo samples as well. You are wonderful!!!!! My team was SOOOO excited when I told them you could print on sticky notes! Thanks so much for all you do and all you teach me. You are fabulous!! This is such a great new way to use post its! I think this will work great for me in Kindergarten on many things too! What a great idea!! Thanks for sharing!! Oh no, I think I've found my summer obsession! I didn't know I could print on sticky notes. Do they have to be a special kind? Love the idea of printing on post its! On a different note, could you give me any advice with Google Docs? I followed one of your awesome tutorials, and usually they post ok, but then disappear the next day :/ Thanks! I think that would be a GREAT idea for you to let us in on your reader response questions! :)I can't wait until summer so I can read EVERY POST ON YOUR BLOG!!!!! I LOVE this idea! I started printing editor's checklists on sticky notes this year and my kiddos loved it. It really did save a lot of paper, which is in scant numbers at my school! Thank you for sharing! Can you point me in the direction of the font I can use to match your file? Sure, it's Pea Heather Michelle from Kevin and Amanda fonts. I love this idea. Since we homeschool, I'm not sure I'll print them, but I may use the printing post-its for another activity. Thanks so much for the great idea. Wow!! What a great idea. I teach Title I reading to 3rd and 5th grade, many who are ESL learners and this will be great to help differentiate. Thanks for sharing! this is amazing. your whole blog is! your blog and ideas have made me "ok" with summer coming to an end 🙂 thank you for this blog! I just made some post-its using your video and templates:) Thank you! Thank you! Thank you! I love that I can make them say what I want them to say!! You are incredible!! Sooooo confused sorry … How are you guys printing on post its? You sticking them onto a page of computer paper? These are so wonderful! Have you added anymore questions? I can't wait to use these with my students!! Hello ~ I just discovered your blog and love you sticky note through the printer idea. Do you have premade sticky notes, besides the QAR ones previously posted, that you sell? I would LOVE to take a look if so. I am trying to get to the google doc for this, but I just get sent to the login for google docs. Can you please help. These look great! I love this idea. Had not heard of this before. I have used labels that are made for the printer, but I bet the Post-its are cheaper. Thank you. This is a great idea. Do you have a list of questions that you have used? I would really appreciate the help. Thanks. Would love to have the questions!! I cannot open the file. Please help!